Why Else Should You Install Water Filtration In Your Home or Business? Stop wasting your hard-earned money on bottled water that may still be filled with dangerous chemicals like chromium. At Howell Services, we offer families throughout the Fort Bend area the opportunity to enjoy the best-filtered water from the comfort of their own homes. Discover the Howell Services difference and enjoy drinking the finest water available straight from your tap! Picking up a bottle of water at your local gas station may appear to be the smart decision until you start adding up the cost. Water bottles cost an average of $1.50, assuming two bottles a day and you are looking at over $80 per month just spent on containers filled with filtered water. Why not get the same quality for a fraction of the cost? Doing the math, you buy 7 gallons of water every month at the gas station, for a price of nearly $8 per gallon. If you install a Whole-Houle Chlorine Filtration System for $800 (75,000 gallons before swapping out the filter) you can instead pay a premium of just eleven cents per gallon. 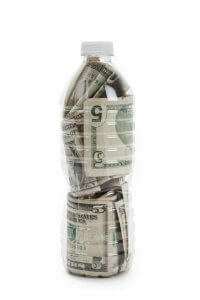 With the average water rate hovering around half a cent per gallon nationwide, this means you can save well over $7 per gallon just by using your own bottles! Contact our sales team to learn how much you can save today! The water coming into your home is not guaranteed to be completely healthy. For instance, Houston, Texas, has recently been battling a rapid rise in the concentration of Chromium 6 in local water supplies. This chemical, which is dangerous at levels as low as 0.02 parts per billion, has been found at concentrations of 0.75 parts per billion. 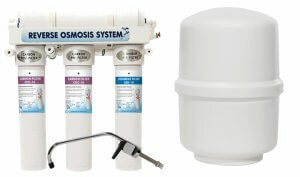 Howell’s water filtration systems are designed to remove Chromium 6, in addition to numerous other dangerous substances. However, it does leave in vital trace elements and fluoride, enabling you to still enjoy all the health benefits that come with regular tap water. Speak with a member of our team today to see which filtration system is right for your family. Howell Services offers a wide variety of filtration devices for every situation and price point. Options range from a simple wall mounted filtration system for $799 to whole-home water softener and filter combinations for nearly $2,500. Our team of experienced water professionals will work with you to determine which system is best for your specific circumstances. Our goal is to help you find the right water filtration system for you and your loved ones. Call us to install your new water filtration system today! Counter space is always at a premium, making counter top filters a nuisance for all concerned. We specialize in helping you enjoy fresh filtered water without having to compromise. Many of our models are installed directly underneath the sink, allowing you quick and convenient access to delicious water. Discover which system best meets your family’s needs and get started on the journey to enjoying healthier water. Check the Erin Brockovich' Chemical Taints Tap Water of 218 Million Americans to check how your city stacks up to chromium in your home.